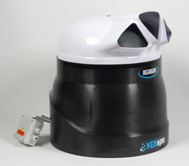 NEB 6500 Industrial Humidifier. Measures 22.5H" x 20.5"W. IN STOCK FOR IMMEDIATE SHIPMENT. Dry weight is 39 lbs. Imported From Italy, NEB 6500 is the largest humidifier we sell. Output is fully adjustable, and the operation is fully automatic. The NEB 6500 is controlled by a circuit board that runs the humidifier and also regulates automatic cleaning cycles that prevent stagnation of water in the reservoir. The NEB is designed to either be wall mounted or suspended from the ceiling. It is ideal for installations with ceiling heights over 12 feet high. It is best suited for commercial greenhouses, commercial food/vegetable operations, and printing/manufacturing. Must be used in conjunction with Reverse Osmosis (RO) filtered water or deionized water. Very low power consumption (23 watts). Consider equipping with the optional Habitat Monitor humidistat (NOTE the NEB 6500 will not work with the 300HH Hydrofogger Humidistat, the 310HH Digital Plug-In Humidistat or the AWS 600 Humidistat). 1 Year Manufacturer's Warranty. The NEB is shipped on a pallet. Please contact us for shipping options and also more information regarding the NEB 6500. Click here for manual or here for brochure.